Ricotta & Lacinato Kale Calzones Fill 1 Created with Sketch. In the 16th Century, pizza was born in the Italian city of Naples. A baked, circular flatbread, it could be topped with anything that would stand up directly to the heat of the oven. In ensuing years, however, someone dared to fold the pizza over. The result was the calzone. 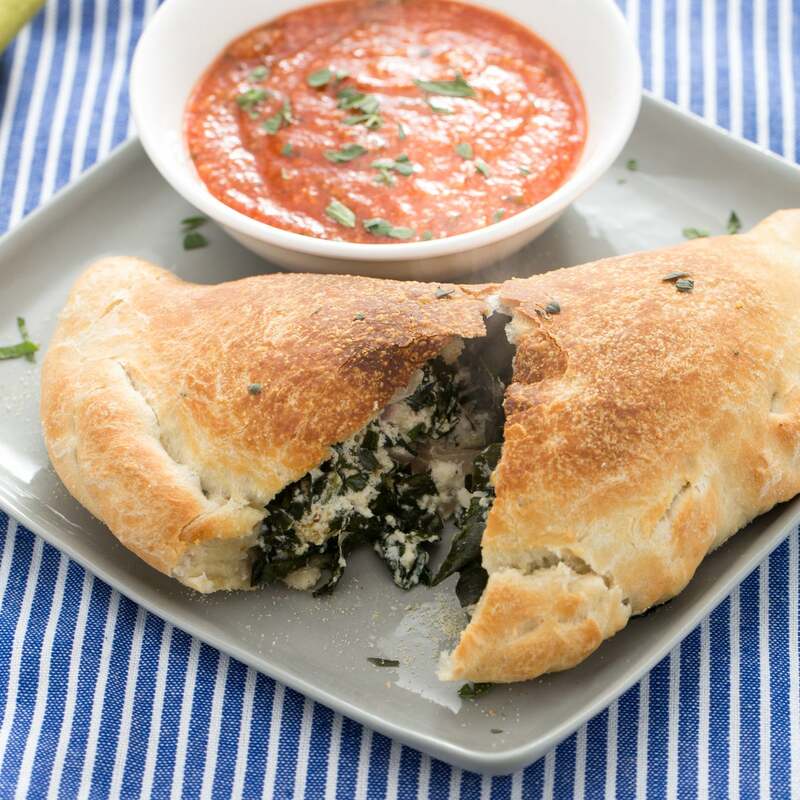 A half-moon purse that seals its “toppings” and cooks them within, calzones combine all of the crispiness of Neapolitan pizza with the moist, delicious interior of a savory tart. Preheat the oven to 500°F. Wash and dry the fresh produce. Remove the pizza dough from the refrigerator to bring to room temperature. Peel and mince the garlic. 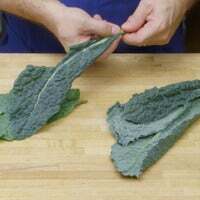 Cut out and discard the kale stems; roughly chop the leaves. Peel and thinly slice the onion. Pick the oregano leaves off the stems; discard the stems and roughly chop the leaves. Using the side of your knife, smash the olives; remove and discard the pits. Roughly chop the olives. In a large pan (nonstick, if you have one), heat 2 teaspoons of olive oil on medium-high until hot. Add the onion and half the garlic; season with salt and pepper. Cook, stirring occasionally, 2 to 3 minutes, or until softened. 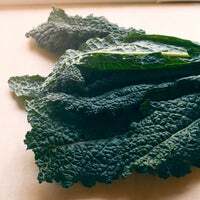 Add the kale, olives, spice blend and ¼ cup of water; season with salt and pepper. 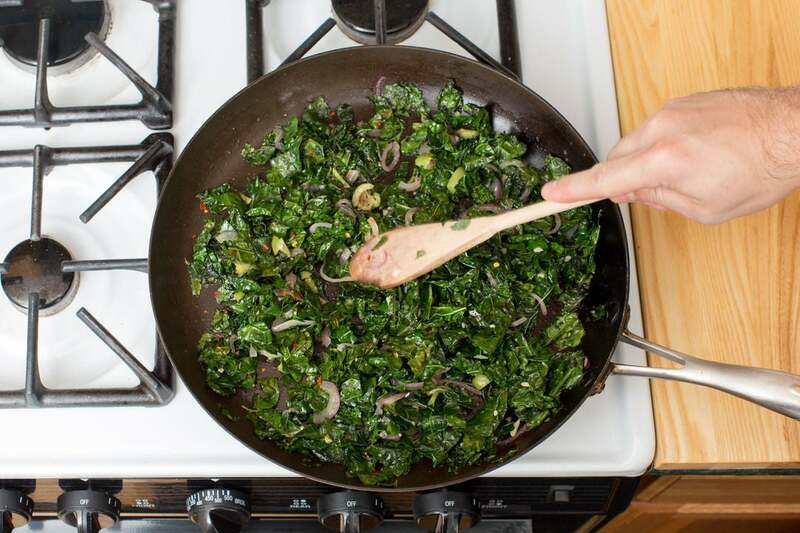 Cook, stirring occasionally, 3 to 4 minutes, or until the kale is tender and the water has evaporated. Remove from heat. 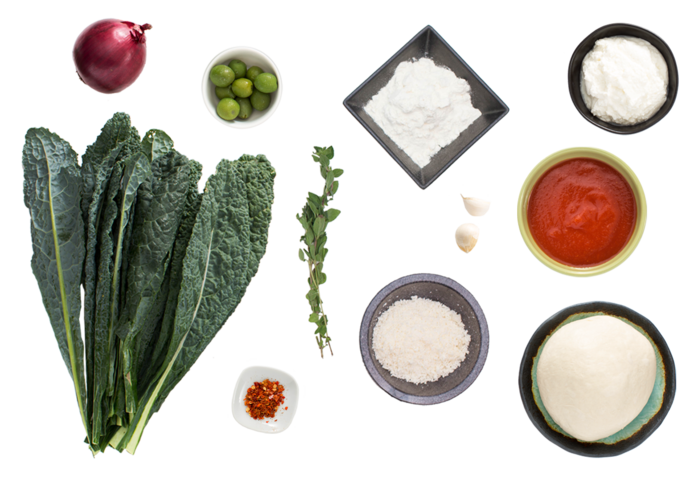 In a large bowl, combine the cooked kale mixture, ricotta cheese and half the Parmesan cheese; season with salt and pepper to taste. Sprinkle a pinch of the semolina flour onto a clean, dry work surface (to keep the dough from sticking). 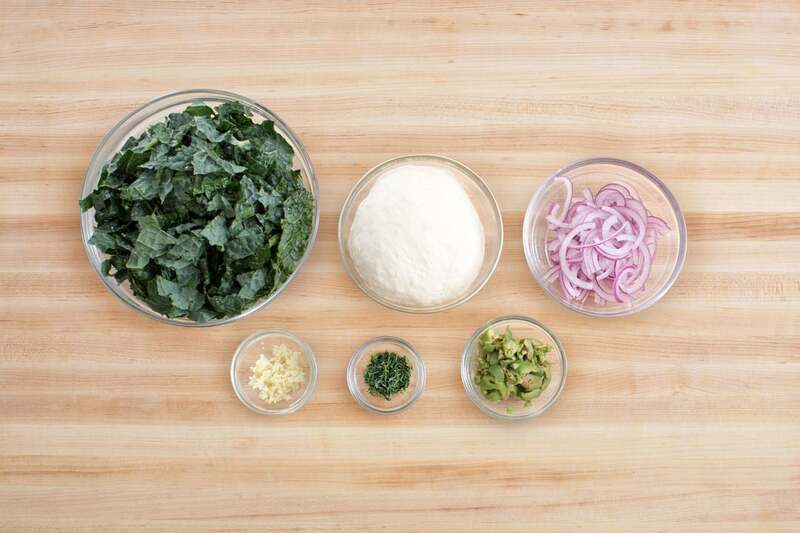 Divide the pizza dough into 3 equal pieces. Using your hands, roll or stretch out each piece of dough on the work surface to make ¼-inch-thick rounds. 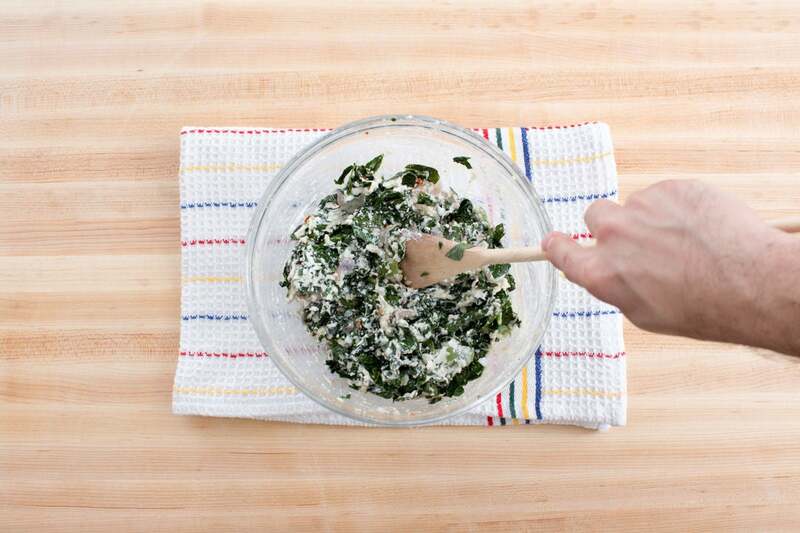 Place ⅓ of the kale filling onto each round; fold the dough over to make half moons. 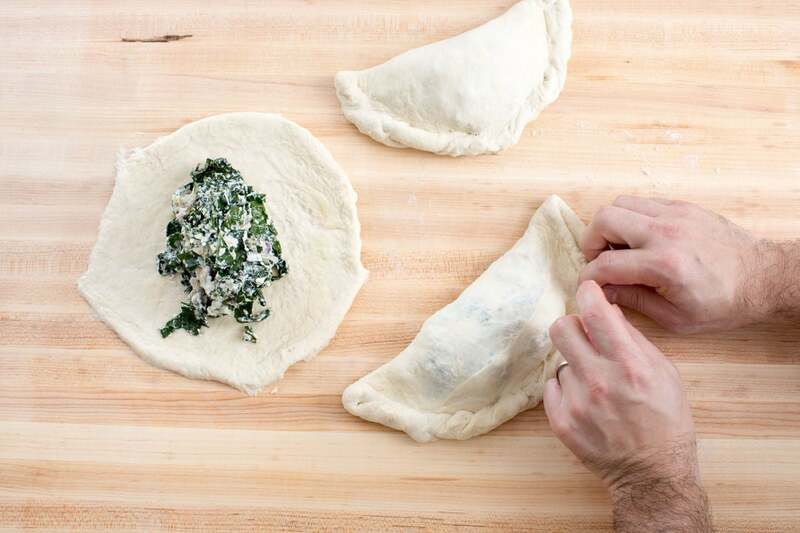 Using your fingers, press or crimp the dough together to seal the calzones. Sprinkle the remaining semolina flour onto a clean, dry sheet pan. Lightly brush the calzones with olive oil, then place on the prepared sheet pan. Bake 16 to 18 minutes, or until browned on the outside. Let stand for at least 5 minutes before serving. While the calzones bake, in a small pot, heat 2 teaspoons of olive oil on medium-high until hot. 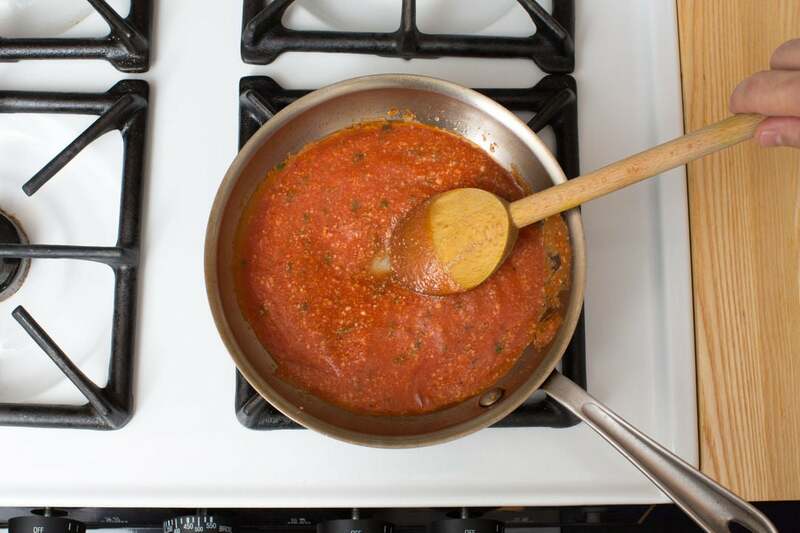 Add the remaining garlic and cook, stirring frequently, 1 to 2 minutes, or until lightly browned. Add the tomato sauce and cook, stirring occasionally, 1 to 2 minutes, or until warmed through. Add all but a pinch of the oregano (save the rest for garnish) and remaining Parmesan cheese. Cook, stirring occasionally, 1 to 2 minutes, or until the cheese is incorporated. Season with salt and pepper to taste; remove from heat. 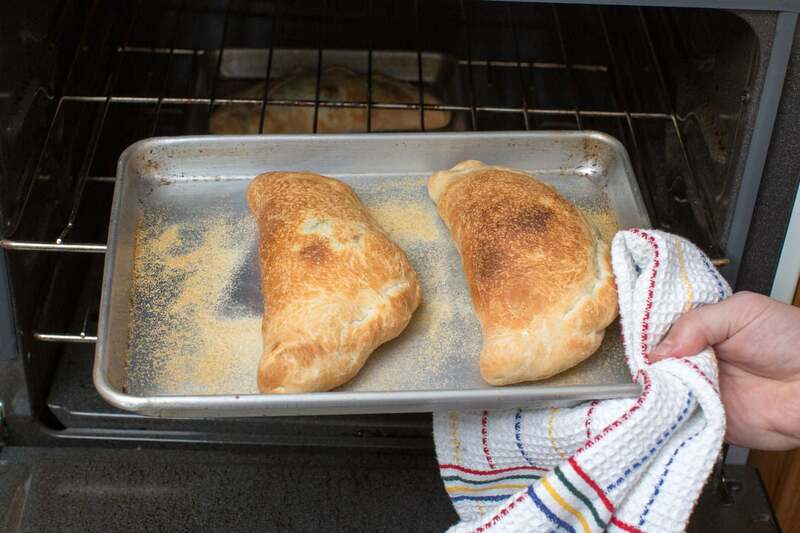 To plate your dish, cut each calzone in half. Serve with the marinara sauce on the side for dipping. Garnish with the remaining oregano. Enjoy!